This week’s reading comes from Sarah Barber and Corinna Peniston Bird’s, “History Beyond the Text”. Piggy-backing off of the importance of Material Resources and Culture, we move into Visual Resources. In his piece, Richards discusses much about the history and development of film and art as an emerging historical piece, what were some ways that historians have used and learned from film? This last week’s reading came from History from Things: Essays on Material Culture, edited by Steven Lubar and W. David Kingrey. What challenges and opportunities does working with material culture present? Monday section: after participating in Luke Habberstad’s analysis of a Chinese vessel, what did you learn about working with material culture? How does Prown’s notion of “material as reflection of culture” compare and contrast with what Luke’s idea of “material making culture”? This week’s reading comes from Learning From Strangers by Robert Weiss. Using case studies and examples, it deals with methods and tactics for conducting in-depth interviews. The first part deals with the work before an interview, the second chapter discusses strategies for during an interview, and the third chapter addresses certain issues that may arise. Primarily a manual for sociological research, it does provide useful tools for conducting oral histories. What are some questions that came up while reading this? Next week we’ll be making our first forays into the Bancroft Library, one of the great (but somewhat hidden) treasures here at Cal. The Bancroft is especially notable for how accessible its collections are to undergraduates and the general public, so be sure to take advantage of it during your time at Berkeley. We’ll be visiting the Bancroft in this week’s sections, but we thought it would be good to give you guys a head start. Exploring the Bancroft is a wonderful book produced in celebration of the Bancroft Library’s centennial, highlighting the variety of books, papers, manuscripts, photographs, and other materials housed at the Bancroft. While the excerpts we included cover a pretty wide swath of the Bancroft’s collections (Western Americana, Latin Americana, the Pictorial Collection, Rare Books and Literary Manscripts, History of Science and Technology, University Archives, Center for the Tebtunis Papyri, the Mark Twain Papers, and the Regional Oral History Office), it’s important to know that these are only highlights and the list is not exhaustive. To get more ideas of what’s available, you can browse the Bancroft’s website to find more collections, both physical and digital. You can also do keyword searches at the Online Archive of California’s Bancroft page to try and find specific collection items related to your topic. What items are you interested in at the Bancroft? If you’re interested in perusing this book and its wonderful photographs, you can find copies of it at Main Stacks, Doe’s Reference section, and at the Bancroft itself. 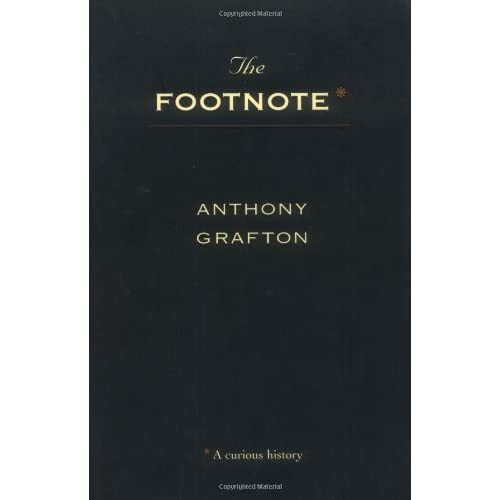 The first chapter of Anthony T. Grafton’s The Footnote: A Curious History traces the development and importance of this oft-overlooked, yet critical piece of hardware in the toolkit of historians and researchers. Raising it above its position at the bottom of the page, Grafton notes its development from annotation and citation in texts from the early Middle Ages as well as its critical role in the professionalization of scholarship. Anthony T. Grafton. The Footnote: A Curious History. Cambridge, MA: Harvard University Press, 1997. What comes to light is that importance of the footnote, which is often perceived as cumbersome and annoying by undergraduates (myself included just a couple years ago), lies in the need for historians to build their arguments on source material whose location and identity is apparent for their colleagues. In some ways, this reading connects to Booth in that both address the importance of writing for a scholarly community, and being aware of the needs of one’s reader. In reading this chapter, note the different developments in the historical profession, as well as the ways in which citation changed. Wayne C. Booth, Gregory G. Colomb, Joseph M. Williams. The Craft of Research. Chicago: University of Chicago Press, 2008. This particular chapter gives you several suggestions for ways to discover topics and turn them into research questions. One useful device is the topic-question-rationale statement. 1. topic: I am studying ______. 2. question: because I want to find out who/what/when/where/whether/why/how _______. 3. rationale: in order to help my reader understand how _______. Don’t get too hung up on crafting the perfect TQR statement right now. Instead of viewing the TQR as a guiding compass for your research, think of it as a tool you could use in your weekly research assignments. Writing these statements down each week is one way of watching how your research evolves over the course of the semester. The authors remind us that the rationale is the hardest part of the statement to answer. By working through the academic literature of your field through reading seminars, practicing new lenses of analysis in your courses, and staying in consultation with a professor (someone who is an expert in their field and is tuned in to the most pressing concerns of scholarly discourse at the moment), you’ll discover questions that remain unaddressed by academic literature or are deserving of more nuanced analysis. If you’re interested in consulting the rest of the book, you can access an electronic copy of it through UC Berkeley’s library. This week’s reading comes from Learning From Strangers by Robert Weiss. It deals with methods and tactics for conducting in-depth interviews. Primarily a manual for sociological research, it does provide useful tools for conducting oral histories. You are currently browsing the readings category at Historical Research Workshop.